Pharmaceutical drug patents enable branded drug companies to prevent market entry by competitors until the patents expire. The term of drug patents varies. The basic term for a patent is 20 years from the date of patent filing, which generally occurs several years before a drug is approved. This means that drugs may have 6-12 years of patent-protected sales after launch. There are conditions under which drug patents can be extended, for example to compensate for time spent waiting for Food and Drug Agency (FDA) review, or for responding to an FDA request for pediatric testing. 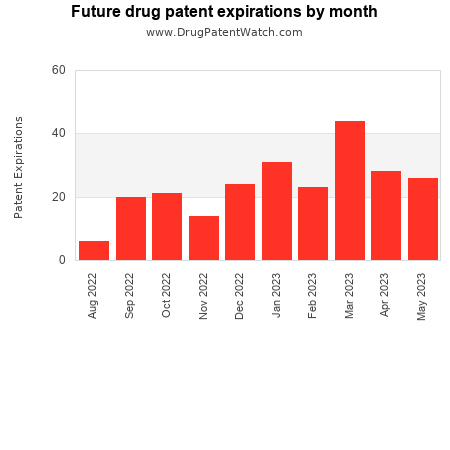 Drug patent expirations can also be used as a bellwether for the pharmaceutical industry — a rise, or fall, in the number of anticipated patent expirations can predict outcomes for branded pharmceutical companies, generic producers, and for healthcare payers.